Just a quick note before I begin: I have fallen out of the habit of making time to post due to a recent new addition to our family, so determined that the best thing I can do is to post something to kick start the good habit again. There are other posts I have been working on and which I want to write more than this one, but as I gave an Elder’s Quorum lesson on this recently, I’m hoping it will flow quickly. “Except a man be born of water and of the Spirit, he cannot enter into the kingdom of God.” (John 3:5) That is the requirement. It is a requirement is so deeply understood in Christianity to the point that many sects baptize infants and/or teach that anyone, no matter how good, who is not baptized, is damned. In fact, it is so important to the gospel that even though it is intended for the “remission of sins” (Mark 1:4) Jesus, the only sinless person to live on the Earth, confirmed and clarified the requirement by getting baptized himself. But there is a second part to that requirement, that of being “born…of the Spirit.” This is a little less clear in the New Testament, but it is there. This refers to the sanctification that comes as a result of the Gift of the Holy Ghost. (Note the capitalized “Gift”.) It is not always mentioned in conjunction with baptism in the scriptures, but there are two places in the New Testament where it is explicit. One is in Acts 2:38 when Peter says “Repent, and be baptized every one of you in the name of Jesus Christ for the remission of sins, and ye shall receive the gift of the Holy Ghost.” The other is in Acts 8, when the Samaritans have accepted baptism but had not yet received the Holy Ghost, and only received it when John and Peter came to them and laid their hands on them in verses 15 to 17. Baptism must be done by full immersion. Both must be performed by someone with the proper authority. The individual must be prepared and willing to accept them. There is a proscribed prayer. It is only done for those who are at least 8 years old. As we believe that all will ultimately have the opportunity to accept baptism, I would argue that the central purpose of baptism is not salvation, but rather the covenant we make with God, that, if upheld by us, will result in salvation. The covenant is described several different ways in many different places, but it comes down to this, we are enrolling in the service of God. We become part of His fold and will attempt to do His will. We are signing up for a life of work, of service to our fellowmen, of constant personal refinement, and, in essence, to try to do the work He would do if He were on the Earth. If we make an earnest effort to do this, Christ’s Atonement will be applied and we will be saved. Yes, the end result is (hopefully) salvation, but that is not the purpose. The purpose is to commit us to making ourselves into people worthy of salvation. This is a principle central to the Gospel as taught by the LDS Church. The purpose of religion is not to set up rules, but is rather for guiding the development of individuals to greater righteousness. That is why the Gift of the Holy Ghost is also a critical piece of the process. 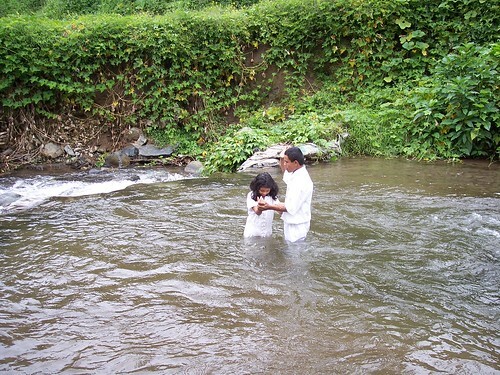 The Gift of the Holy Ghost, as taught by the LDS Church, is only available to baptized and confirmed members of the Church, in contrast to the influence of the Holy Ghost, which is available to all. The main difference between these is that we have the right, inasmuch as we keep ourselves worthy, to the constant companionship of the Holy Spirit. Most people will feel the Holy Ghost when they are doing God’s will, whether they recognize it or not. With the Gift of the Holy Ghost, the gifts of the Spirit, as spoken of in 1 Corinthians 12, are made more powerful. We also believe the Holy Spirit can assist us in all parts of our life, whether or not it is directly related to God’s work; the Holy Ghost can be a source of inspiration in both secular and spiritual endeavors. The Gift of the Holy Ghost also imparts a greater portion of the fruit of the Spirit. (Gal 5:22-23) Through the power of God and the direct influence of the Holy Spirit in our lives, we can find greater love, joy, peace, faith and happiness. Our efforts to find these in our lives are magnified by the Gift of the Holy Ghost. This is really the core of what drives Mormons to proselytize. We have covenanted, through baptism, to do God’s work, and we are rewarded disproportionately by the Gift of the Holy Ghost when we do so. We have tasted divine joy and want to share. We have experienced the power of God through the Holy Ghost, and have had our lives changed. We’ve seen others’ lives changed through the same power. Our love has grown through the infusion of the Spirit. We rejoice in your happiness. We want to work with you so that we may all gain greater peace and happiness through Christ. The term “fundamentalist” is not one used in the Mormon church. As a result of this and growing up in Utah, I never heard it applied to churches or believers until high school or college. In figuring out what it meant, I have felt that there are definitely ways in which it applies to the LDS Church, albeit with caveats. We believe in miracles, angels, revelations, the Creation and that God the Father was the literal father of Christ. So, what is it that makes us different from other fundamentalist religions? In one word, science. We believe in all truth, whether revealed to prophets or discovered by scientists. Fundamentalism, on the other hand, generally refuses to acknowledge science unless it agrees with established belief. So, I’ve come to think of our kind of beliefs as “enlightened fundamentalism.” Meaning that we believe in the power of God, but also believe that God is limited (as we all are) by reality — laws of physics. We do not pretend to understand HOW God does what he does, but we believe that he does it through a perfect understanding and ability to manipulate (as scientists do) an environment. Now, the challenge is that no matter how much we learn (time machines excepted), we will never be able to go back in time and use whatever new-fangled scientific tools we might have to detect the actual processes whereby miracles were wrought. So, even if we get to the point where we can explain miracles or detect the presence of spirits scientifically, there will always be at least some amount of uncertainty that requires a leap of faith. Therefore, for me, the purpose of science in enlightened fundamentalism is not to provide proof or repeatable results, but rather to link together enough information to be able to hypothesize a feasible process that meets our understanding of reality and religion, and that allows a glimpse of the power required to work miracles. Do we know that this is how it works? Absolutely not. It is, however, a reasonable hypothesis in harmony with both science and the doctrines of the church. It also illustrates the point that science and religion can be used together in the search for truth. We need not assume (as seems to be the popular wisdom these days) that they are contradictory by nature. When we believe miracles are impossible, its very hard to have faith. When we can imagine processes that would produce miracles, it allows our faith and our understanding to flourish. I’ve always been fond of puzzles and logic. In many ways this has shaped my view of the world and my approach to life. When met with a question or problem I treat it as something to be answered or solved, not an obstruction. All questions have answers and all problems have solutions – for those who are willing to take the time to find them and who are willing to accept the answer or solution they find. I have always enjoyed the process of using logic to answer a question or solve a problem: starting with a set of assumptions and then using knowledge of relevant facts to reason out a set of possible answers and then examining each solution to pick the best fit. When I was growing up, I assumed that everyone approached questions this way. Growing up, I used to think that I could show someone the truths of the Gospel through logical argument in a way that would make it impossible to disbelieve, if only they would take the time. I was awfully naïve. However, this naïve belief was a product of a religious upbringing that embraced logic and reason. It is a doctrine of The Church of Jesus Christ of Latter-day Saints (LDS Church or Mormon Church) that “all truth can be circumscribed into one great whole.” The only difference between truths of the Gospel and truths of the laws of physics are in the way they are discovered and how they are applied to our lives. I hope to use this blog as a platform to both help other members of the Church who may have questions about seeming incongruities between science and the Gospel and also to explain our beliefs to people who are not members of the Church in a hope of fostering better communication and understanding. I do not pretend to write on behalf of the church. Though I believe everything I plan to write to be in harmony with the teachings of the church, there may be points that other members or leaders of the church might dispute if they happen to read them. In particular, one of the things that I hope to do is discuss the reasoning behind my belief in the doctrines, which is something that is generally very different for each individual. I will try to make the distinction between my thoughts and Church doctrine clear.